Chinese food is one of my comfort foods – give me a meal full of dumplings, noodle soups and rice dishes, and it’ll satiate my hunger and subdue any feelings of anger, frustration, and woe. 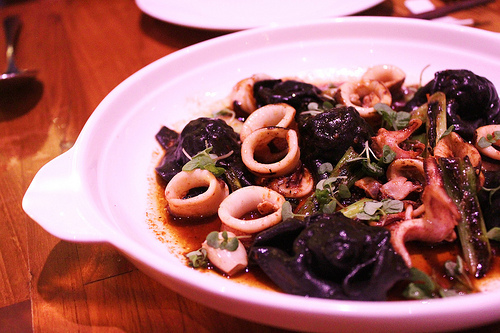 Mister Jiu’s is a bit different than your normal MSG-filled Chinese restaurant around the corner. 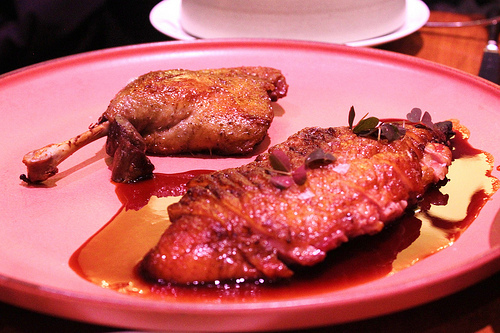 Even though they are located in the heart of San Francisco’s Chinatown, they’re making a new version of Chinese food, one that’s worth trying out and waiting for. 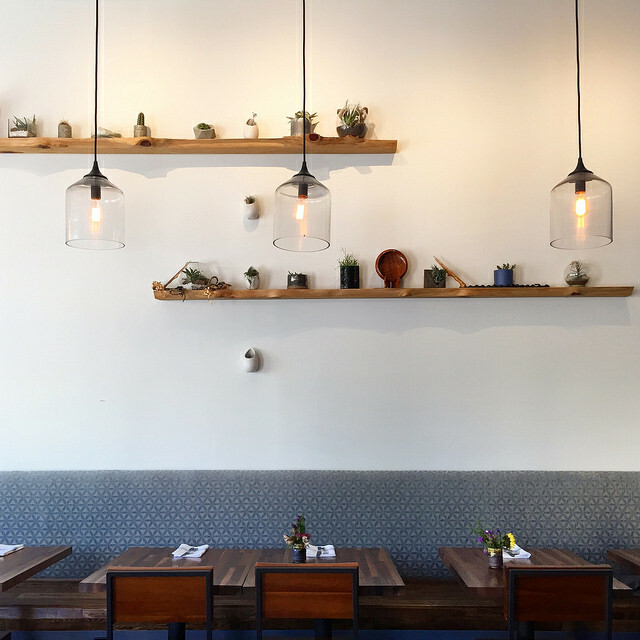 The photos will showcase dishes from the banquet and a la carte menu, so make sure to check out their seasonal menu prior to dining if you’re looking to have the same exact dish. 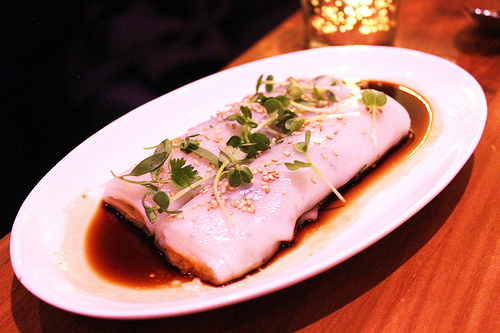 Rice noodle roll (腸粉) with uni was a luxurious update to the traditional shrimp or pork filled noodle roll that you find at dim sum restaurants. The crepe felt as if it was very delicately made – silky smooth, not too oily – and worked well with the bits of creamy uni as it would slosh in your mouth. 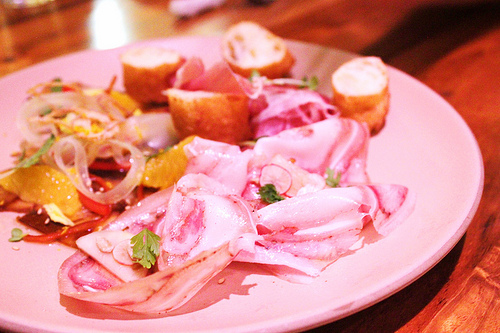 The charcuterie plate made of: Devil’s Gulch Pig Head, Chilled Beef Tendon, and La Quercia Cured Ham with fried dough (油條) is worth tasting. Like the traditional cold plates, it was served as an assortment and each cut with great balance between salt, meat and fat. The fried dough was not oily either, and only made me wish I had a bowl of porridge to go with it. Note: I’m also a huge fan of anything Devil’s Gulch so this won over my heart easily. 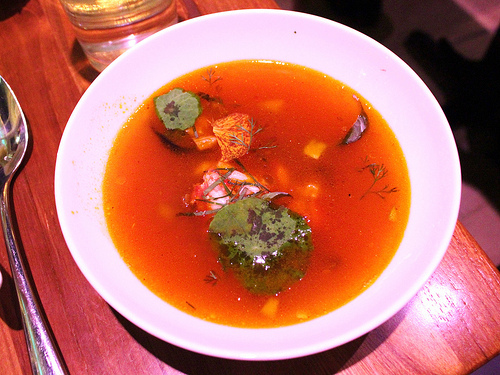 Their version of hot and sour soup uses early girl tomatoes, lily bulb, and pieces of spiny lobster. This is something undeniably delicious; the perfect amount of sweetness and tart consumed with well-cooked lobster, nothing heavy about it. 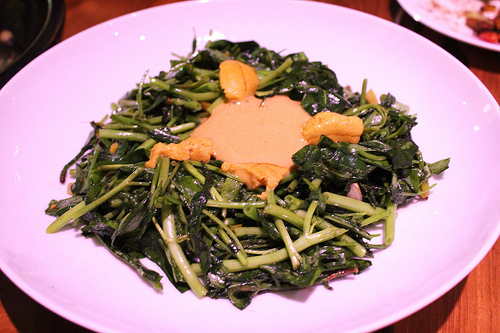 A simple vegetable dish of tendrils, greens and stems was topped with uni mousse and pieces of uni. It was easy to scarf down this dish, with tender bites of vegetables mixed with intense umami flavors that sloshed around in your mouth. Their wontons with pork, garlic chives with pieces of Monterey squid was delectably made, each part being cooked to its right consistency. 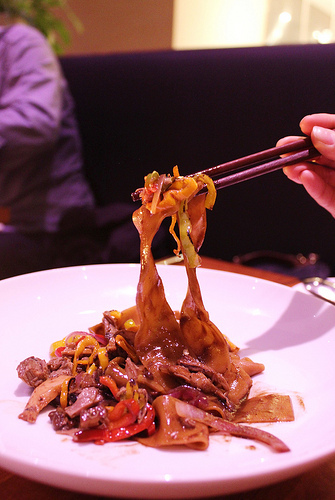 One of my favorite dishes – the hand-cut noodles tossed with sweet peppers, soy-braised beef, and black garlic – as the waitstaff mentions “a labor of love”. They make these noodles each morning by hand, and inevitably use it all since it’s such a popular dish. The noodles had a “give”, a chewiness, that marries perfect together with intense flavors of the beef and garlic. 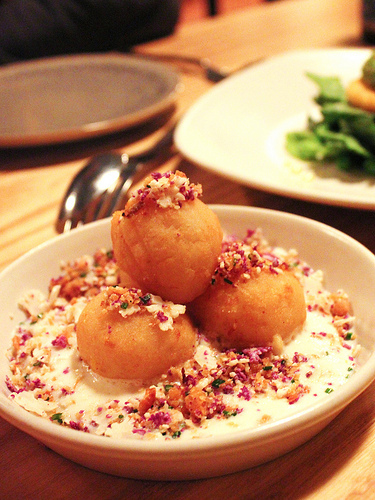 I plan on going back just for this very dish because it’s just that good. 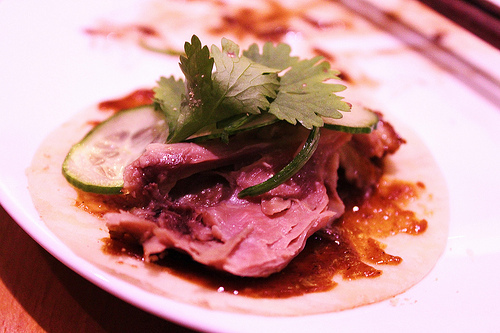 Their tea-smoked Liberty Farm duck was their rendition of the traditional peking duck that’s typically carved by the waist-side. This dish was served with the traditional wrapper skin, and also other condiments e.g. peanut butter hoisin and toppings like cucumbers and cilantro. 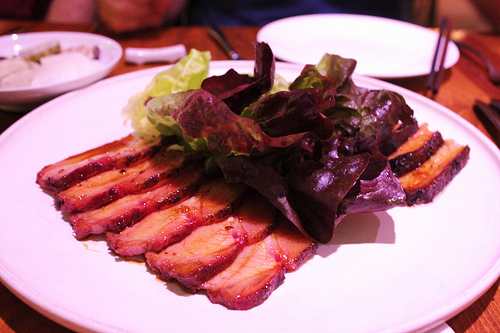 Their Berkshire char-siu BBQ pork served with lettuce that was delicious and wonderfully flavored. 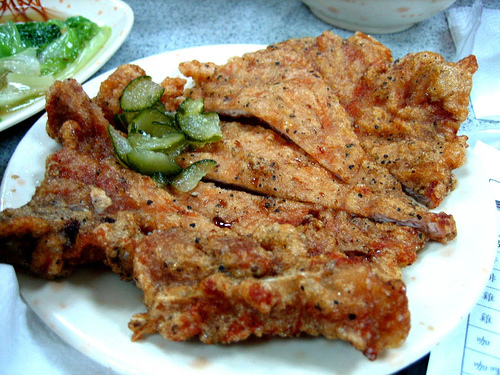 Juicy, tender and salty – everything you want in a piece of pork. 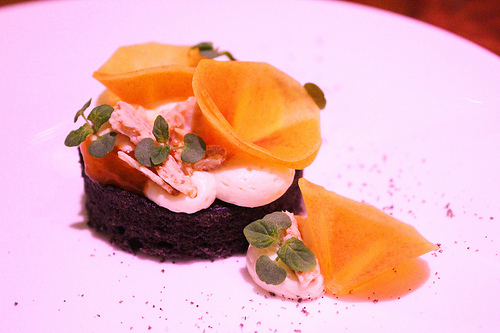 Last but not least, their black sesame cake topped with young ginger mousse, fuyu and Hachiya persimmon to celebrate and signify the winter produce. It was really light despite the black sesame portion, and for those who love persimmon (surprisingly not me) you would probably appreciate this a bit more. 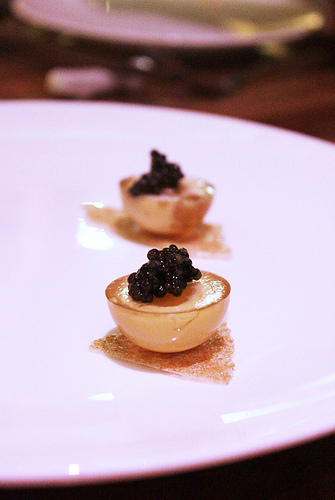 With their newly awarded (and well-deserved) Michelin star, Mister Jiu’s is a restaurant to visit and dine at in San Francisco. It’ll be exciting to see what they whip up in the future, and I’m hoping to taste every bit of it!